The Natural Restaurant is the only truly authentic Thai food restaurant in Phuket, using skilled chefs who have created the delightful flavours of classical Thai cooking with their great knowledge of tradition and an exotic palette of spices. 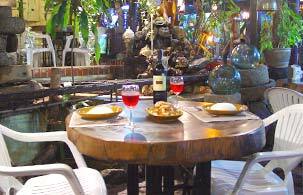 This restaurant is an affordable ambience - a special treat for anyone who loves good living and wonderful food. Ingredients are selected daily from the highest quality suppliers and this is reflected in the flavours & presentation of each dish.